At the tender age of 11 years old, Makana Franzmann already has a resume that rivals most veteran athletes. Becoming a traveling skateboarder before he was 8, Makana was well on his way to action sports success. Now living beachfront at Rocky Point on the North Shore, he and his brother Dylan have one of the best surf spots in the world as their backyard to practice in. With skate skills translating to progressive surf skills, this little sprite is turning heads with fresh moves daily. 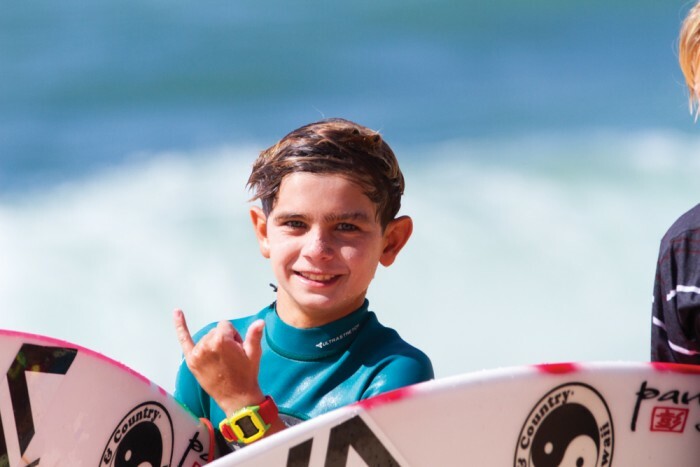 And with a recent NSSA national title added to his name, Makana’s young achievements are on par for certain greatness. Keep an eye out for this grom. School – HTA, Hawaii Tech Academy. It’s mostly a home school program with a class once a week in Waikele. It’s cool because we get to surf a lot more. You could do a lot of work in a just a few days and then have most of the week free to surf. Favorite subject – Science. Experiments are cool! Favorite surfer – John John Florence. He just has it all, barrels, turns and big airs. I just enjoy watching him surf. Favorite female surfer – Carissa Moore for her big man-hacks. Favorite skateboarder – Raven Tershy and Grant Taylor because they’re super gnarly and commit to everything, they’re super sick. Favorite music – Gangsta Rap like N.W.A, Straight Outta Compton. It’s good. Hobbies – Spearfishing and skateboarding. I used to play with airsoft guns but my brother Dylan shot me up with a bunch of bb’s so that kinda ruined it for me. Rocky point is by far my favorite spot. It’s a great right and left. The right, you can get really barreled, do a big turn or cutback and kick out before you hit the death rock. The left is super long and is hollow at the beginning. You can pull in or go for a big hit and it just keeps going and you can do a ton of hits with a nice oncoming air section at the end. Tell us about when you first started surfing Rockys. I started surfing Rocky Point when I was 6 years old on a 3ft day. We were on the lefts near the channel and my dad would push me on the little ones. I was really afraid of the reef because at that time I’d only surf sandbars. But ever since we moved here I’ve been surfing reef breaks everyday and now I love them. I’m definitely not as into skateboarding as much as when I was 8 years old. I used to travel all across the United States doing skate contests, I won a couple… But now I just go to the Banzai (skatepark) almost everyday. Usually in the evenings because it has been so hot lately. It’s cruise, lots of groms, it’s fun.